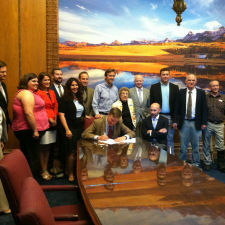 Colorado Hits the Accelerator for Electric Vehicles! Colorado has strengthened its claim to being a national leader in promoting electric vehicles with the passage of HB 1332 legislation that is designed to make the state income tax credit for electric vehicles more effective at increasing EV sales. The bill makes two major changes – simplifying the tax credit, and making the credits assignable, allowing them to function more like a point of sale rebate. The Washington Post and Time Magazine describe this bill as making Colorado the best state to buy a new electric car. Colorado already had an income tax credit in place for EVs, in place through 2021. This, along with a suite of supportive policies, has propelled Colorado into the top ten states for per capita EV sales. In 2015, a hard year for EV sales nationally, Colorado bucked the trend with a 10% increase in EV sales over 2014. But the changes in HB 1332 should further accelerate sales! The existing credit was up to $6,000 per car, based on a complicated formula including battery size, the cost of the car, and the level of federal tax credit received by the buyer. It was too complicated for consumers to understand – or for auto dealers to communicate to customers. It also meant that people buying more expensive EVs got larger tax credits, even through research shows that tax credits have a bigger influence on consumer purchasing decisions for lower cost EVs. The average consumer ended up getting about $5,000. HB 1332 makes the credit a flat $5,000 for anyone buying an EV (including plug-in hybrids with battery size over 4kwh), and $2,500 for anyone leasing. The existing credit already had one unusual and very attractive feature, which is maintained under HB 1332 – it was fully refundable, meaning that a consumer gets the full value of the credit even if it exceeds their tax liability. But the big change in this bill is to also make the credit assignable. This means that a car buyer will have the option to sign the credit over to the car dealer or financing agency. Effectively, this turns the tax credit into a point of sale incentive. Research suggests that the same amount of money as a point of sale incentive will stimulate significantly more sales than a tax credit that must be claimed the following year (Source: Collantes and Egbert, 2014, The Effect of Monetary Incentives on Sales of Advanced Clean Cars in the United States: Summary of the Evidence, UC Davis Policy Institute). The concept of an assignable tax credit in Colorado was first proposed by SWEEP in 2014. The Colorado Energy Office championed the idea, drafted legislation, and worked with a broad coalition including General Motors, Nissan, SWEEP, hydrogen and natural gas vehicle proponents and the environmental community to pass the bill with broad bipartisan support (99 out of the 100 senators and representatives in the state voted yes!). Meanwhile, other states in the Southwest have more work to do to incentivize EVs. Utah is furthest along – they adopted a $1,500 tax credit for EVs in 2014, which helped stimulate EV sales and brought Utah's per capita sales into the top 10 states in the nation. Civic leaders recognize EVs as an important tool to help address big air quality challenges in the Salt Lake City area. The tax credit is now in effect until the end of this year. In 2016, the legislature authorized their major utility, Rocky Mountain Power, to invest up to $2 million per year in EV charging infrastructure and customer incentives for EV charging. In order to ramp up EV sales in Utah, the state should extend the tax credit at least through 2020 and make it assignable to the car dealer or finance agency. Arizona has a somewhat unusual incentive, in the form of a reduced license fee for alternative fuel vehicles. On average, this is almost $4,000 over the lifetime of each vehicle, but only a small portion of this benefit is during the first year of ownership. This makes the incentives less effective. Converting to an upfront incentive, would spur greater sales. Neither New Mexico or Nevada currently have financial incentives for EVs. We urge both to move forward on this front. Colorado's policy leadership is reflected in the sales data, as shown in the following chart. The three states with incentives have higher sales than the two without. More EVs are sold in Colorado as a percentage of all new vehicles than in other states, and HB 1332 should continue if not amplify this trend. In order to reap the benefits of EVs, states across the Southwest should follow Colorado's lead.